We are excited to bring on to the menu our first coffee from Costa Rica, a red honey processed coffee from Finca Sircof. Costa Rican coffees are total crowd pleasers, they are known for having super crisp acidity as well as distinct berry and tropical fruit notes. Finca Sircof is a 20 hectare farm owned by husband and wife Marco and Maricela Oviedo. 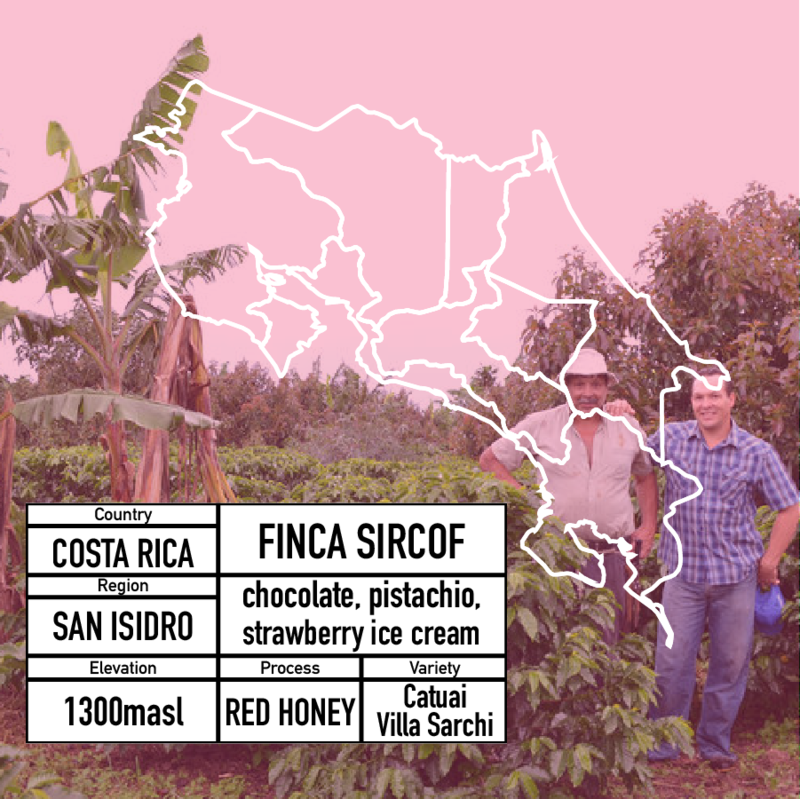 The farm has been in family hands for two generations but Finca Sircof was at a crossroads. It could no longer compete in the market while following their traditional operational standards. Marco and Maricela risked all of their savings and built a micro mill on the farm to take control of the processing and production chain of the coffees they were growing. Similar to the Finca Meirisch farm in Nicaragua that we bought coffee from last season, Finca Sircof is nestled within a rain forest. The location of the farm means a positive coexistence between the farm and a prospering and preserved rain forest. Red Honey refers to how the coffee is processed. While it may be more common to see coffees labeled was “washed” or “natural” a honey processed coffee is smack dab in the middle. Natural processed coffees are picked from their shrubs and placed directly on patios in the sun to dry. This is the OG process but is also requires a lot of training to ensure that the coffee is raked evenly and often. In honey processing the skin is removed but the mucilage is left on the seed to dry. It is the sticky texture and the golden amber color of the mucilage reminiscent of honey that led coffee producers to name this method the honey process. In washed processing the coffee is washed thoroughly to remove both the skin and mucilage from the bean. Now the "red" part of the honey process is in relation to how long is the mucilage left to ferment and dry in the sun. Yellow honey spends the shortest amount of time drying, red honey is a medium amount, and black honey is the longest.